UFC 216 was held on Saturday October 7 at T-Mobile Arena in Las Vegas. The event comprised eleven bouts with two championships featured on the card. 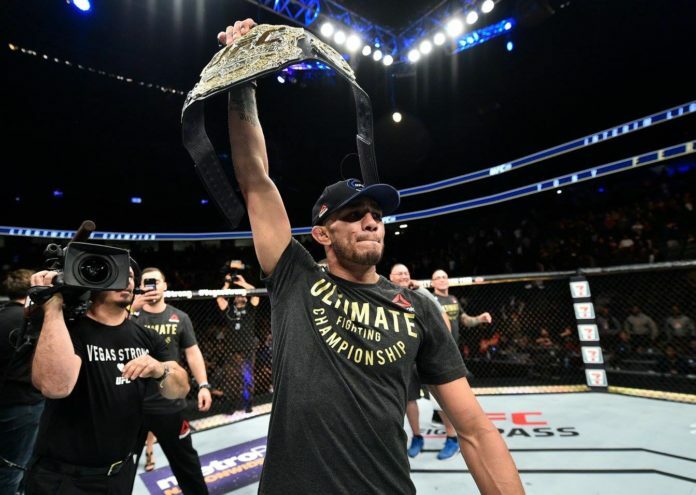 In the main event Tony Ferguson defeated Kevin Lee via the first-round submission. As a result he earned UFC interim lightweight title. The reigning champion in the division is Conor McGregor who took the belt last November in New York. On the top of the main card Demetrious Johnson made history when he defeated Ray Borg via the fifth-round submission. Johnson became the first fighter in UFC with most title defenses of all time, at eleven. Before the event, the fight card suffered a change when Derrick Lewis was forced to pull out from his heavyweight bout against Fabricio Werdum due to back pain. The latter remained on the card and defeated Walt Harris, who was previously expected to fight Mark Godbeer on the preliminary card. Godbeer did not compete at the event. Also on the main card Mara Romera Borello defeated Kalindra Faria via the first-round submission in their women’s flyweight bout. The lightweight bout between Beneil Dariush and Evan Dunham ended in a majority draw. Complete results can be found below.